If you or a family member lives gluten-free, 150+ Gluten-Free Family Favorites is a useful tool in your cooking shed. This cookbook includes gluten-free breakfasts, breads, appetizers, entrees, sides, salads, desserts, holiday and kid-friendly recipes. What’s nice is the authors don’t add a bunch of recipes that are already inherently gluten-free. There are no quiches in the breakfast chapter—just yummy scones and cinnamon rolls. The most confusing part of cooking gluten-free is what flour to use for each recipe. There are basically two kinds of regular flour—all purpose and wheat. But there over 20 different kinds of gluten-free flour that are usually used in combination. 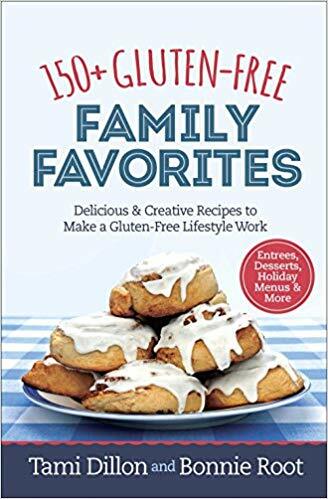 150+ Gluten-Free Family Favorites not only tells exactly which flour to use for each recipe but includes a whole chapter explaining which ones to use for any family recipes that you may want to adapt to your lifestyle. I love the great variety of recipes and all the information within this cookbook. However, I miss calorie counts and serving sizes. There are also no warnings of other allergens. Worst of all there are no pictures! Looking at the food is the main way I decide if I want to make it. Though I admire the effort, I can’t give this cookbook more than 3 stars. Thanks to Harvest House Publishers and NetGalley for an advanced copy.